The Facebook "product type" attribute corresponds to the product default category path. To fill in this attribute, our module uses the PrestaShop native function "breadcrump", which fetches the full category path (that is to say the path of each product you want to export). For example : Electronics > DVD players > BluRay. In most cases, the product path will correctly be fetched. 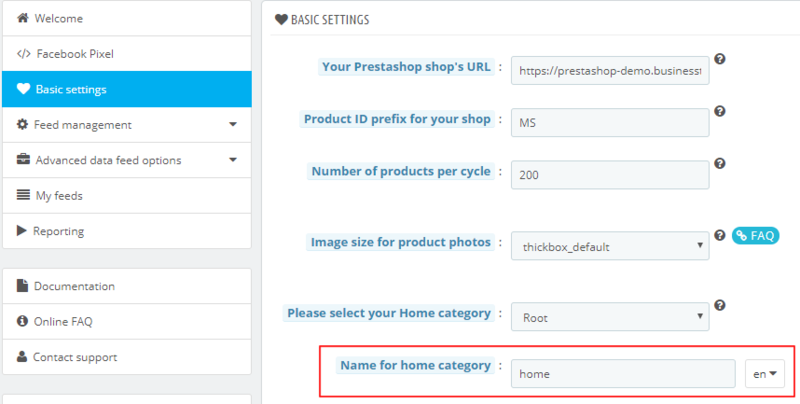 However, if you have, for example, products which path is limited to the "Home" default category of your shop, the PrestaShop "breadcrumb" function will return an empty value. But Facebook requires a not empty value for the "product_type" tag. So, it's why we have set up a "replacement" value that will be entered in the "product_type" tag if the "breadcrump" function wouldn't work. Make sure to give a replacement value for every language by clicking on the drop-down menu next to the field.